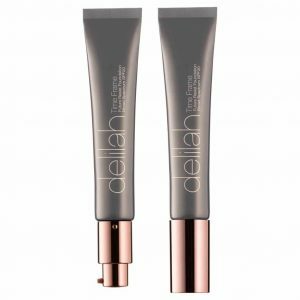 Louise Lunn Make-up features Delilah as her product of the week. Its the time of year when everyone needs a little more coverage and some extra glow to our winter skin. Delilah’s Time Frame Future Resist Foundation is just what you need. The liquid formula offers a lightweight yet buildable coverage for a flawless complexion and gives a subtle luminosity and a velvety texture. Vitamin E works as a powerful antioxidant to prevent against environmental damage while a blend of peptides helps to prevent signs of ageing. Time Frame contains a broad spectrum SPF 20 for everyday protection. Time Frame Foundation is ideal for daily use, leaving skin smooth, even and perfected. Right now we can’t get enough of Holly Willoughby, well here is some news ………Holly’s favourite ‘go-to’ brand is Delilah and she can be seen here at the NTA’s wearing Time Frame Future Resist in Pebble. Make-up by Patsy O’Neill Make-up. Delilah’s Time Frame can be purchased below at a reduced price.